The Sloan Digital Survey used data from NASA’s Galaxy Evolution Explorer (GALEX), to map out several parts of the universe where dead stars once exploded. 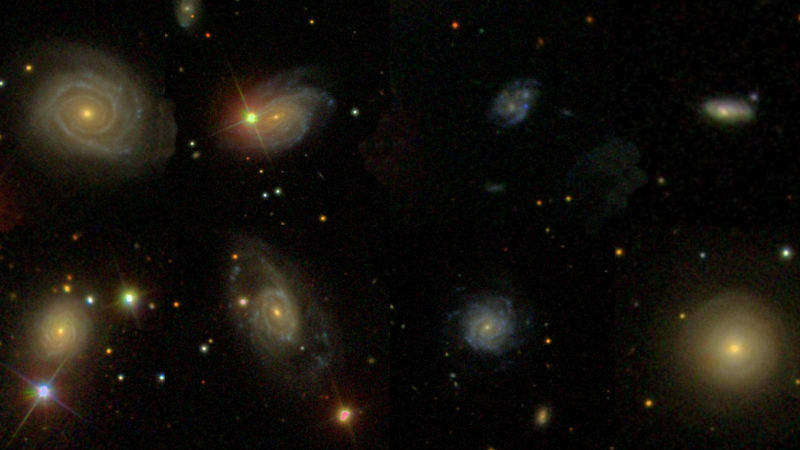 Six of the galaxies that experienced these type Ia supernovae are shown above. From left to right (and top to bottom) these galaxies are NGC 6038 (SN 1999cc), UGC 5234 (SN 2003W), A112539+2249 (SN 2004as), A225942-0000 (SN 2005ku), M+05-54-41 (SN 2006en), UGC 14 (SN 2006sr), UGC 8162 (SN 2007F) and IC 807 (SN 2007cp). 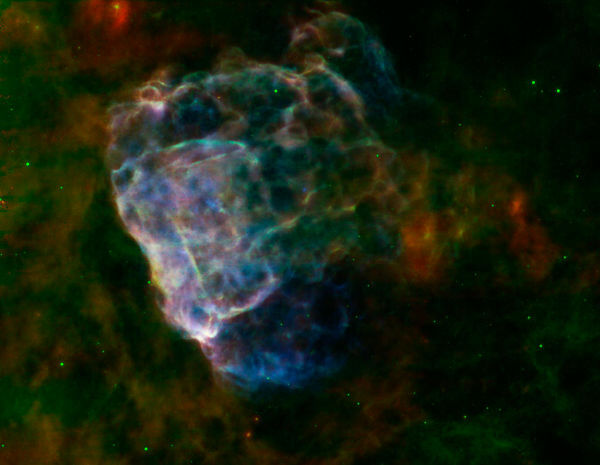 This image shows a delicate blend of infrared and X-ray light as a bubbly cloud from an irregular 10 light year wide shock wave, generated by a supernova that would have been witnessed on Earth 3,700 years ago. The remnant itself, called Puppis A, is around 7,000 light-years away from Earth. The bright, lit up areas result from the shock wave slamming into surrounding clouds of dust and gas that fill the interstellar space in this region. What’s supernova Cassiopeia A made of? Cassiopeia A (Cas A) is what remains of a supernova in the constellation Cassiopeia. Cas A is a massive star that exploded in a supernova more than 11,000 years ago and has long confounded astronomers and scientists. NASA’s Chandra X-ray Observatory took images (top) of Cassiopeia A using low-energy X-rays which showed certain elements, such as iron, that were heated by the shock waves released in the explosion of Cas A. The iron is seen mainly in the outer portions of the star. 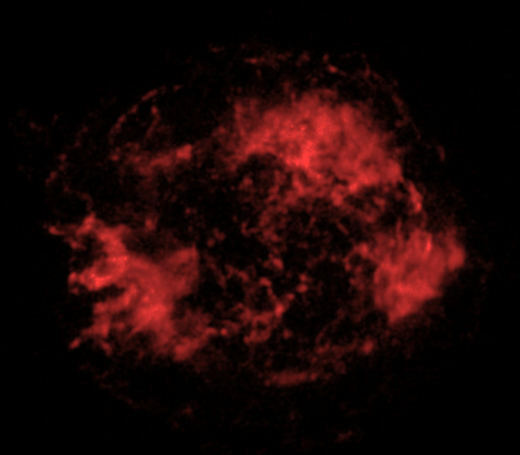 A millennium ago, about 160,000 light years away from the Milky Way galaxy, a supernova exploded in the Large Magellanic Cloud (a satellite galaxy to the Milky Way). 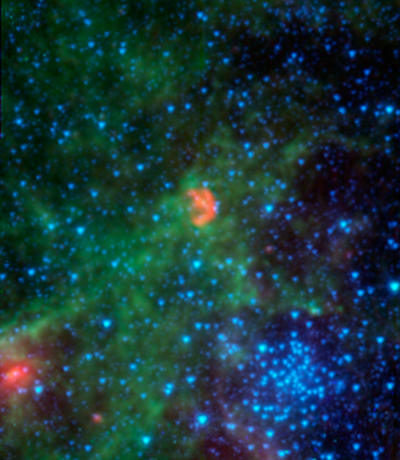 The Spitzer space telescope’s advanced instruments picked up the infrared light emitted by dust from the remnants (red), the ambient background areas (green, yellow) and the remaining stars (blue). The closely grouped set of blue stars in the lower right of the image is the cluster known as NGC 1850. Spitzer’s Infrared Array Camera (IRAC) was used to compile the data for this picture. This very “psychedelic” looking image didn’t originate in any human mind, no matter how stimulated. Instead it gives us a peek into the marvel that is our universe. This composite image was taken by the Hubble Space Telescope (HST) and shows a stunning supernova in a part of the northern constellation Cygnus, the Swan. The bubble-like expanding blast wave is believed to have resulted from a colossal stellar explosion, that occurred about 15,000 years ago. The supernova remnant is within the plane of our Milky Way galaxy and is 2,600 light-years away. Data from Hubble allowed astronomers to directly compare the actual structure of the shock with their theoretical model calculations. 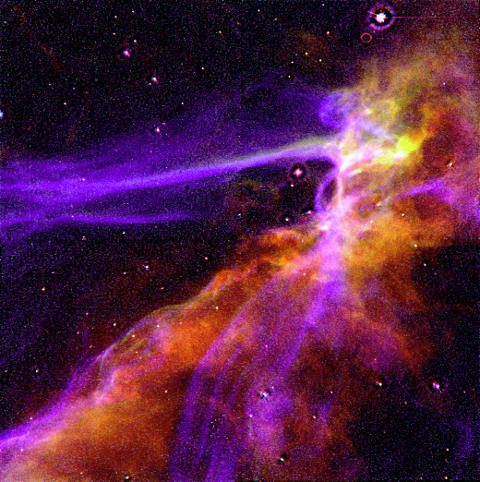 The supernova image shows the blast wave overrunning dense clumps of gas, where the different colours represent different gases at certain temperatures (red=sulfur; green=hydrogen; and blue=oxygen atoms).